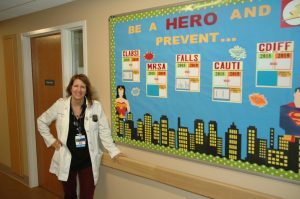 As the Assistant Nurse Manager Heidi Allison creates multiple ways for people to interact. Photo courtesy: Providence Medical Group. 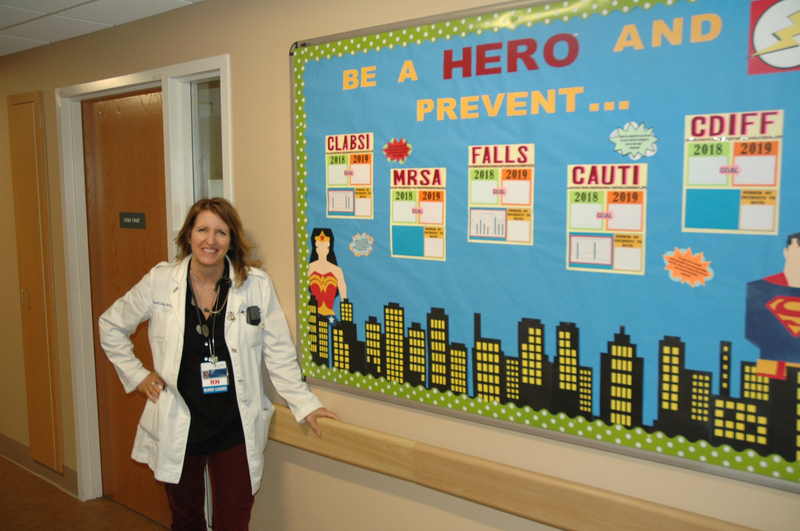 Nurses may not wear capes anymore, but they certainly qualify as super heroes. The demands on their emotional and physical beings are intensified by long hours and demanding situations. Providence St. Peter Hospital takes this to heart and provides many avenues of support for the more than 1,100 registered nurses who work there. Heidi Allison, an assistant nurse manager, is part of the team that cares for the caregivers. She gives credit to hospital programs that has made the path a viable option for her. Heidi Allison brings her nursing skills and management background to support the clinical care providers at Providence St. Peter Hospital. Photo courtesy: Providence Medical Group. With the future in mind, Heidi started attending South Puget Sound Community College (SPSCC) to get all her prerequisites for the nursing program. This was in addition to her job and family life. Heidi was determined to get excellent grades, because she knew the competition for nursing slots was highly competitive – 300 people vying for 30 slots. 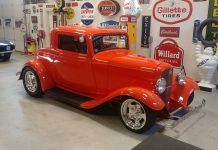 Though she started her career in the insurance industry on the administrative side, Heidi dreamed of another job. “I wanted to be a nurse,” she explains. She continued to work in the insurance industry for a decade, but she held onto the idea that a good way to get into the nursing field would be to volunteer. She went to St. Peter Hospital to do just that. Her initial assignment was folding towels for the operating rooms. While not close to the patient care she had hoped for, she did it anyway. In 2010, Heidi became a perioperative support assistant (PSA). She turned down a full-time position with Providence in order to accommodate the rest of her life and commitments. Instead, she worked at the hospital part-time, mostly long weekend hours. It was an incredibly demanding time. Heidi made the grades and secured a spot in the nursing program, but that was just the beginning. She recalls people dropping out all along the way for not passing tests or keeping up with the workload. It took intense commitment but her fortitude endured. Heidi loves being on the team that supports the well-being of the nursing staff. Photo courtesy: Providence Medical Group. One of the benefits of working with Providence is receiving tuition support. Providence University in Great Falls, Montana, creates classes for competency in health care. Some people go to college online. RN’s are encouraged to get their BSN and even advance to a master’s degree. This makes continuing education a reality (like it has and is doing for Heidi). Heidi eventually earned her Bachelor of Science in Nursing (BSN) and her RN designation. She remembers passing her nursing boards as “my best day ever!” She left behind the work as a PSA and spent the next year in a residency program at St. Peter. This is where new nurses work with, train and follow peers in various areas of nursing. It is similar to programs that doctors follow. Heidi spent the next four years on the floor at St. Peter, finally getting that patient contact she had imagined for so long. “I love working at Providence,” she says. She aligns herself with the core values of Providence, which are excellence, compassion, justice, integrity and dignity. Heidi works closely with the nursing staff and still appreciates patience contact. Photo courtesy: Providence Medical Group. “Sometimes I miss the floor,” explains Heidi. But her ability to support her co-workers from a management angle gives her satisfaction. 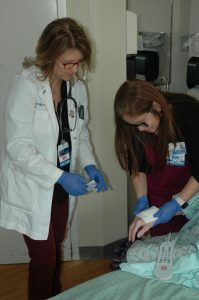 She knows nurses often take care of themselves long after others are cared for, and she is around to encourage nurses to take the time and space they need during the normal, challenging events of a day. 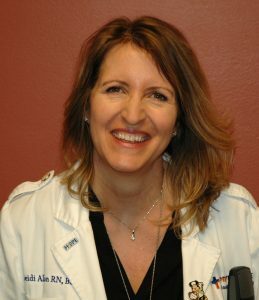 Her administrative background, combined with her nursing experience, propelled Heidi to her current position as assistant nurse manager. She is there to coordinate schedules and have direct contact with the nurses to address their concerns. Sometimes Heidi wears scrubs and participates with activities on one of the floors. Ironically, she said she has performed CPR more in her current position than when she was a floor nurse. Her availability and attention to the work environment are important to the hospital caregivers. Providence St. Peter Hospital has Magnet recognition, a national program that identifies health care organizations that provide nursing excellence. This is significant to those interested in being employed by such a facility because it means care is not just by the nurses, but also for the nurses. There are only two other hospitals in the state with this same distinction. The 390-bed facility is also a regional teaching hospital, which was founded by the Sisters of Providence in 1887. Additionally, St. Peter is a regional leader in cardiology, neurosciences, oncology and orthopedics, and Stroke Center of Excellence since 2007. As the Assistant Nurse Manager, Heidi Allison creates multiple ways for people to interact. Photo courtesy: Providence Medical Group. “I’m happy where I am,” said Heidi about being with Providence. She is considering tackling her master’s degree using the hospital’s tuition support. 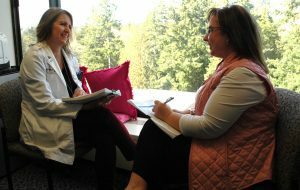 In the moment, she knows first-hand the challenges nurses face with patient contact and why nursing support is critical. Heidi understands that superheroes need care too. Providence considers that all the employees are caregivers. This attitude reflects Providence’s intention to be in service to this community. St. Peter Hospital employees almost 3,000 people making it the largest private employer in Thurston County. They have nearly 1,100 bedside RNs and then another 100 or so RNs who serve in management and administrative position. There are also more than 200 LPNs/CNAs. Learn more about Providence St. Peter Hospital at their website.